What if you could lose fat FASTER, get stronger and leaner, even when you’ve entered your 40s or beyond—all while increasing your cardiovascular and heart health in as little as 12 minutes per day? Well, the 3 published research studies you’ll see below prove you CAN. If you’re currently in your 40s, 50s, or 60s, there is a newly discovered 12-minute exercise shortcut you can use to experience TEN-FOLD greater fat loss and burn 991% MORE fat than traditional exercise routines. Introducing: The 12-Minute Fat-Burning Shortcut. A ground-breaking new exercise trick for people in their 40s, 50s, and 60s that allows you to access stubborn fat cells up to 300% FASTER than normal while doubling your rate fat loss EVERY time you exercise. And no matter what your age, gender, or current condition is, right now you can use this new 12-minute breakthrough to take your metabolism and fat loss to a whole new level. And even though they have good intentions, this is complete nonsense. As you’ll soon discover, there are several studies below showing the exact opposite is true. There is a better way. A 12-minute shortcut you can use starting today that can DOUBLE your rate of fat burning, helping you visually SEE your belly get FLATTER in less than 7 days from now. Ever felt that burning sensation in your muscles when you lift weights or exercise intensely? This is a key indicator that you’re stimulating lactate (aka – lactic acid), a shortcut to helping you release more growth hormone, which can accelerate your fat loss and calorie burning. How do you automatically stimulate lactate? Simple: Perform your resistance training sets with 20 repetitions or more, and make sure you “feel the burn” by the time you hit 20 reps. If you don’t feel the burning sensation in your muscles, keep going until you do. It’s super easy. If you select a weight that’s too heavy on an exercise and can’t make it to 20 repetitions, just quickly change to a lighter weight while resting as little as possible, and continue the SAME exercise until you hit at least 20 reps of a chosen body part. This type of high rep training works especially well for people in their 40s, 50s, and 60s, because you stimulate more collagen production and increase tendon strength, all while being MUCH easier on your joints. As soon as you complete your high rep set you’ll immediately move to a 20 – 60 second cardio exercise burst with as little rest as possible in between bursts to increase oxygen and blood flow to all your working muscles. So unlike traditional weight training, where you stand around resting between sets wasting time, your rest period now becomes a fat-burning results accelerator. Normally this is considered to be a SIN in the fitness and weight loss world, because most fitness professionals have been programmed to believe you’ll lose strength and burn up precious muscle. That’s why you’ll hardly ever hear personal trainers recommending the 12-Minute Fat Burning Shortcut Solution. But the science and real world results says otherwise. Research from W. Jackson Davis and colleagues at the University of California at Santa Cruz and the University of California at Berkley looked at this issue in a September 2008 study in the Journal of Strength and Conditioning Research . They compared the results of 28 women divided into two groups. Group one worked out with weights followed by cardiovascular exercise bursts on a treadmill. The second group did an equal volume of weight training and equal amounts of cardiovascular exercise… only this time they used the Fat-Burning Shortcut Solution with the cardiovascular exercise wedged in-between sets of weight lifting. 991% greater loss in fat mass! The results are pretty incredible! Nearly a ten-fold greater loss in fat AND they gained muscle at the SAME time. This is normally considered impossible. Another study titled, “The exercise-induced growth hormone response in athletes” (EIGR), indicates as little as 12 minutes of the Fat Burning Shortcut Solution can increase growth hormone secretion for up to 24 hours. Research also shows this approach decreases the feeling of soreness from exercise, known as DOMS (delayed onset muscle soreness), by speeding up recovery and repair. This may explain why exercisers using this approach were able to gain more lean muscle, as well as burn significantly more fat. Conversely, long duration endurance training does the exact opposite. It has been shown to age you FASTER, while blunting growth hormone secretion. And right now you can use step 1 and step 2 TOGETHER using the 12-Minute Fat-Burning Breakthrough found on the next page to keep your heart working and pumping out more blood, which means more blood flow and oxygen to your working muscles. When you deliver more nutrients to your muscles, you enhance their ability to generate energy because you’ll have more muscular endurance from the increased oxygen and blood flow. As you can clearly see, with the Fat Burning Shortcut your normal workout can easily be transformed into a hybrid of resistance training combined with interval-based cardio, which is proven to be a POWERFUL combination that will take your fat burning to the next level. Unfortunately, there are a few nagging problems that come along with trying to attempt this type of Fat Burning Shortcut. FIRST: You need to have access to the RIGHT equipment so you can alternate between weight lifting and cardio bursts correctly. SECOND: You need be able to move back and forth from each exercise VERY quickly to get these results, which can be extremely difficult in a gym or health club environment. THIRD: You need to be working the RIGHT muscles, at the RIGHT time, and in the RIGHT order for it to work properly. HOWEVER: The exercise breakthrough found on the next page proves there is a better, EASIER way ANY man or woman in their 40s, 50s, or 60s can use to achieve the SAME mind-boggling results as the studies above with NO equipment… and it takes ONLY 12 minutes. 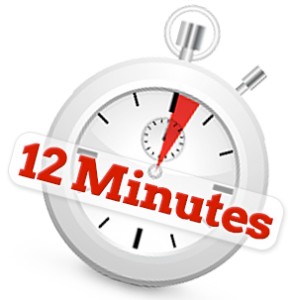 That’s why this 12-minute exercise breakthrough will fit so perfectly into your lifestyle. You can literally DOUBLE your rate of fat burning in as little as 12 minutes per day, and it works in PERFECT harmony with the hormonal changes that are happening in your body right now. If you insist on standing around wasting time in between every exercise, or you think longer workouts are supposedly BETTER, then don’t bother wasting your time with the 12-Minute Fat Burning Shortcut. It’s simply NOT for you. But if you’re looking for a new way to burn fat FASTER, get stronger, get leaner, and look younger—all while increasing your cardiovascular and heart health, just click the Next Page button below and you’ll see exactly how to put this powerful strategy to work on your body TODAY. It’s safe, it works FAST, and it’s specifically designed for the “hormonal state” of people in their 40s, 50s, and 60s. Now you can visually SEE your belly quickly get flatter in as little as 12 minutes a few times per week, WITHOUT long, boring exercise sessions or worrying about the metabolic damage caused by traditional exercise or long, boring cardio. Ahtiainen, Juha P., et al. “Heavy resistance exercise training and skeletal muscle androgen receptor expression in younger and older men.” Steroids 76.1 (2011): 183-192. Davis, et. al. Concurrent training enhances athletes’ strength, muscle endurance, and other measures. Journal of Strength and Conditioning Research. September 2008;22(5):1487–1502. Sports Med. 2003;33(8):599-613. The exercise-induced growth hormone response in athletes. Davis, et. al. Elimination of delayed-onset muscle soreness by pre-resistance cardioacceleration before each set. Journal of Strength and Conditioning Research. January 2008;22: 215–225. My computer froze while watching the video, is there anyway you can email me the information needed without having to try to watch the video for a third time? I bought the program but accidentally wrote the wrong address , I have sent a message on PayPal to you and have sent an email to you but have still heard from you. i’m very interested in this exercise. I was interested in your information and wanted to find out more so, I clicked on your video. All you did was repeat yourself over and over and over, with run on sentences that never ended and never got to the point. 30 minutes later, I gave up.